The leatest kernel V1.47b for R4i SDHC V1.4.3,R4i SDHC V1.4.2,R4i SDHC V1.4.1 which works with DSi V1.4.3. 1. Fix recreate save file issues due to NDS filename big/small capital letter problem. 2. Improve unkown new games loading routine (to avoid errcode=-4 problem). 3. New hints screen, presss "START" to view hints. 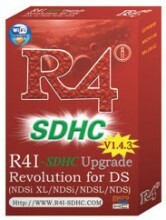 R4i SDHC V1.47b for R4i SDHC V1.4.3,R4i SDHC V1.4.2 1.47b NEWEST!